Last updated 22 September 2016 . By Oz Wills. Situated at the end of Wardour Street, they’ve secured a prime location for those Oxford Street revelers and wandering theatre goers looking for a quick bite to eat. Split into two sections by a nice brick wall partition, the front area overlooks the kitchen and the back area has a more intimate, secluded feel about it. It’s not huge but it doesn’t need to be. 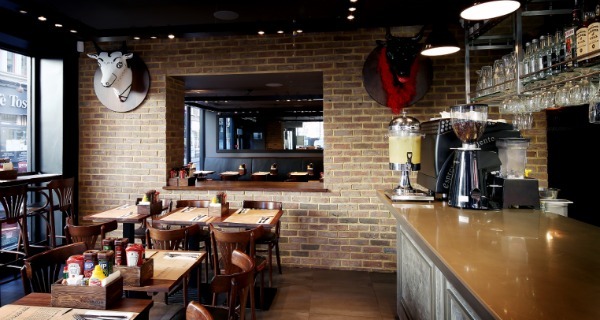 Possessing that familiar American diner feel, Brgr.Co does however have a nice element of quirk about it. Located on the brick wall for example, were two strange plaster cast cow heads. On further enquiry, we were informed that they’re a company concept whereby artists and sculptors are invited to create their very own takes on the front end of a cow. Sold at auction every few months and with the proceeds going to charity, it’s a nice little touch and sets it aside from some of the other burger merchants in the area. We arrived relatively early and opted for the back area. It was not overly busy but sufficiently full to have a nice buzz about the place and the service all night was excellent. The playlist was a little odd in that it appeared to consist solely of Ed Sheeran and Sam Smith album tracks but this was actually a nice respite from the usual downtempo house music that emanates from many a trendy Soho eatery. Brgr nails the classic American diner set-up on Soho's buzzing Wardour Street. One glance at the menu and you can see that Brgr.Co have opted for the keep-things-simple approach. There’s no long list of exotically named patties here, just two sections, Brgrs and Signature Brgrs with a veggie and falafel option on offer (a trace of the Lebanese coming through?) for those not into meat. The standard section is made from a Blade Steak patty as the base (starting at £6.75) and offering a range of variations around this such as the Chilli Brgr and the Guacamole and Cheese Brgr and our eventual first choice The Stilton Brgr (£8.50). Certainly not lacking in size (often a pet peeve of mine), there’s something about a good quality cheese on a good quality burger and this one did not disappoint. In the signature section, The Rump Steak Brgr (£12.50) comes captioned with the rhetorical question ‘The best burger in London?’ and so I had to see whether it could stand up to this rather bold declaration. In true steak fashion, you’re asked how you like it cooked and I followed the medium rare recommendation from the waiter who was impressively well versed in all things Brgr. Though it may not be the best burger in the city (a high claim by anyone’s standard), it’s certainly a good effort and when topped with a bit of bacon and cheddar (optional add ons among others), it then becomes a force to be reckoned with. For sides we went for Onion Rings (£3.50) and some Parmesan Truffle Fries (£6) which are essentially upmarket cheesy chips but well worth their rather hefty price tag. Again, there’s no frugality with the portion size here and so if you’re umming and ahhing as to whether to order that extra side, I would suggest erring on the side of caution to avoid leftovers and an ‘I told you so’ from your fellow diners! I have a sweet tooth (shoot me) and so it was nice to see a well populated dessert section full of shamelessly indulgent naughties. Add to this the Great Shake & Floats section and you’ll be hitting the gym a little harder next week. My partner in crime went for the Baked Vanilla Cheesecake (£3.50) a hefty slice drizzled with a raspberry coulis type sauce and I went for the Sacred Sundae (£5) which was essentially ice cream, chocolate and M&M’s, all of which are a surefire way to my heart. Indulgent patties, upmarket cheesy fries and ice-cream sundaes are on the cards at Brgr's Soho branch. 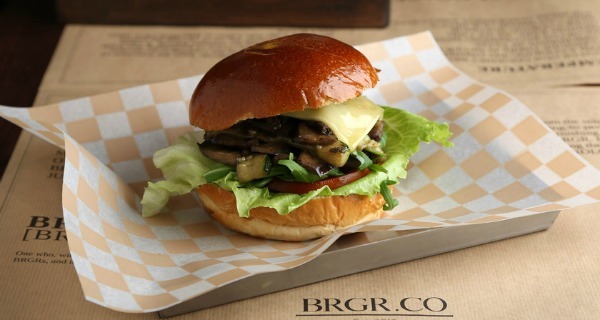 Brgr.Co are certainly up against some stiff opposition in joining the burger market here but manage to hold their own. If you’re looking for a quick fix of both quality and quantity at a reasonable price, then this place ticks all the boxes… Now I’m off to waddle round some shops.